Source Floor & Specialties Inc.BlogEntrance MatsWhere Do Your Entrance Mats Come From? People today pay more attention than ever to their environmental impact. That attention goes beyond what they buy, but also where they buy it – more and more consumers prefer to purchase from businesses that have environmentally friendly policies of their own from rooftop to floorboards. Buying locally-made products is a easy way to reduce your environmental footprint and support your local economy. 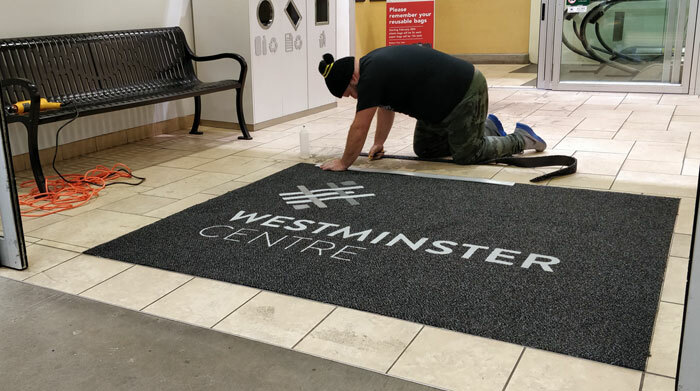 We’re proud to say that our Grizzly FX entrance mats are 100% made in North America, from the raw nylon being woven in Georgia right to the final assembly, logo inlay, and finishing touches being done here by hand in Port Coquitlam. Even our Grizzly Edging is made right here in Coquitlam! Locally-made mats means that our end-to-end manufacturing process meets stringent North American quality standards for environmental impact and industrial processes. No part of a Grizzly FX mat comes from outside North America, and fully 75% of the nylon used as the main face fibre in our Grizzly FX mat is made from recycled Econyl material! We sell them here, so we build them here. Do you know where your entrance mats come from?